In less than one week, salsa and bachata fans from the world over will be coming to Toronto for the 13th Annual Canada Salsa & Bachata Congress. Hosted by Jennifer Aucoin & Steps Dance Studio Inc., the four-day long event will feature 35 international artists, 60 dance companies from across the globe, 40 of the world's best instructors, ten DJs and a live band. Attendees will be able to join in a variety of workshops for all levels, beginner bootcamps, master intensives, four nights of social dancing in three ballrooms, and the 9th Annual DanceFeet Canadian Championships with Professional, Amateur & Pro-Am Heats & Showcases. Also on site will be 20 vendors and booths which will include presenting partners DanceFeet, Telelatino and Ossington Chiropractic and Rehabilitation. This year, for the first time, all of the events, workshops, performances, parties, trade show and accommodations will take place under one roof at the beautiful Fairmont Royal York Hotel with over 50,000 square-feet reserved for this incredible event. Click here to view photos from last year's Canada Salsa Congress. Cost: Tickets for attendees range from $20 to $40 for individual show or evening tickets up to $195 for a day and evening pass. Or save on à la carte pricing by purchasing a full pass for $300. Online sales close Wednesday, October 7 at midnight and tickets must be picked up at the registration booth. Tickets can also be purchased at the door but the prices will be higher. 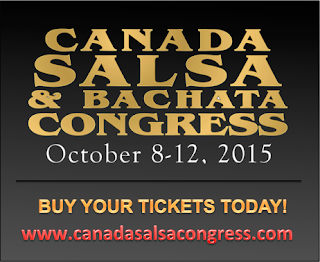 Win Tickets to the Canada Salsa & Bachata Congress! You can enter to win either one or both sets by completing the Rafflecopter forms below. Please note that the winners will be contacted by email and will need to provide their full name within 24 hours of receiving the winning email notification in order to claim their prize. Winners will need to show photo ID at the registration booth at the Fairmont Royal York Hotel to pick up their tickets. Prizes include admission only. Done :) I'd love to go Saturday night! My husband adores salsa!